Athens is known for historic sites, museums, nightlife, shopping, and fun & games. Your plan includes some of its best attractions: delve into the distant past at Acropolis of Athens, explore the world behind art at Benaki Museum, wander the streets of Monastiraki, and indulge your taste buds at Food & Drink. For more things to do, ratings, and tourist information, refer to the Athens sightseeing planner . Porto Seguro, Brazil to Athens is an approximately 20-hour flight. You can also do a combination of bus and flight; or do a combination of flight, ferry, and bus. You'll lose 5 hours traveling from Porto Seguro to Athens due to the time zone difference. Prepare for a bit warmer weather when traveling from Porto Seguro in July: high temperatures in Athens hover around 38°C and lows are around 28°C. Finish your sightseeing early on the 28th (Sun) to allow enough time to travel to Istanbul. Istanbul is known for historic sites, museums, shopping, nature, and nightlife. Your plan includes some of its best attractions: take an in-depth tour of Hagia Sophia Museum / Church (Ayasofya), take in the spiritual surroundings of Suleymaniye Cami , hunt for treasures at Kapali Carsi, and admire the masterpieces at Kariye Museum (The Chora Church). Plan trip to Istanbul with our itinerary maker to find out where to go and what to do. Fly from Athens to Istanbul in 5 hours. Alternatively, you can do a combination of flight and shuttle; or drive. The time zone changes from Eastern European Time (EET) to Eastern European Time (EET), which is usually a 1 hour difference. Plan for slightly colder temperatures traveling from Athens in July, with highs in Istanbul at 34°C and lows at 23°C. Wrap up your sightseeing on the 2nd (Fri) early enough to travel to Dubrovnik. Dedicate the 5th (Mon) to wine at some of the top wineries in the area. There's still lots to do: delve into the distant past at Walls of Dubrovnik, don't miss a visit to Upper Corner Tower Foundry Museum, wander the streets of Old Town, and get engrossed in the history at Rector's Palace. For maps, where to stay, traveler tips, and more tourist information, refer to the Dubrovnik route planner. You can fly from Istanbul to Dubrovnik in 6 hours. Alternatively, you can do a combination of flight and bus; or drive. Traveling from Istanbul to Dubrovnik, you'll gain 2 hours due to the time zone difference. In August in Dubrovnik, expect temperatures between 34°C during the day and 24°C at night. Finish your sightseeing early on the 6th (Tue) to allow enough time to travel to Hvar. On the 8th (Thu), spend a thrilling day on the water with a speed boat tour. There's still lots to do: get great views at Spanjola, tour the pleasant surroundings at Dubovica, take in the spiritual surroundings of Franciscan Monastery, and kick back and relax at Mlini Beach. To see ratings, other places to visit, and more tourist information, go to the Hvar online trip maker . Traveling by ferry from Dubrovnik to Hvar takes 4 hours. Alternatively, you can do a combination of car and ferry; or do a combination of bus and ferry. Expect a daytime high around 36°C in August, and nighttime lows around 26°C. Finish up your sightseeing early on the 11th (Sun) so you can travel to Rome. Get out of town with these interesting Rome side-trips: Tivoli (Villa Adriana & Villa d'Este). There's still lots to do: steep yourself in history at Colosseum, take an unorthodox tour of Catacombe di San Callisto, admire the masterpieces at Musei Capitolini, and take in the spiritual surroundings of Vatican Museums. For more things to do, other places to visit, maps, and tourist information, refer to the Rome travel planning app . You can do a combination of ferry and flight from Hvar to Rome in 6.5 hours. Alternatively, you can do a combination of car and ferry; or do a combination of ferry and train. Expect a daytime high around 38°C in August, and nighttime lows around 24°C. Wrap up your sightseeing on the 16th (Fri) early enough to travel to Ravello. Ravello is a town and comune situated above the Amalfi Coast in the province of Salerno, Campania, southern Italy, with approximately 2,500 inhabitants. 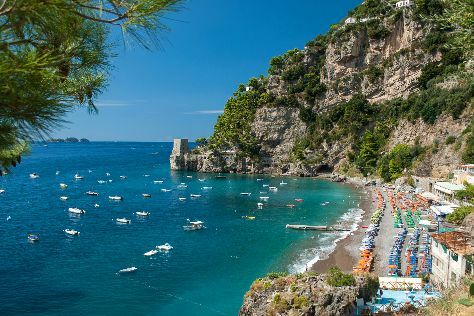 Explore Ravello's surroundings by going to Positano (Kayaking & Canoeing & Fornillo). There's still lots to do: don't miss a visit to Villa Rufolo, take in the spiritual surroundings of Duomo di Sant'Andrea, take in nature's colorful creations at Villa Cimbrone Gardens, and take in the dramatic scenery at Valle delle Ferriere. For reviews, traveler tips, more things to do, and tourist information, read our Ravello trip itinerary planning tool . Do a combination of train and subway from Rome to Ravello in 3 hours. Alternatively, you can drive; or do a combination of train and bus. When traveling from Rome in August, plan for slightly colder days and a bit warmer nights in Ravello: temperatures range from 34°C by day to 28°C at night. Finish up your sightseeing early on the 20th (Tue) so you can travel to Florence. Take a break from Florence with a short trip to Guardastelle Vineyard in San Gimignano, about 1h 10 min away. There's still lots to do: explore the world behind art at Uffizi Galleries, take in the spiritual surroundings of Cathedral of Santa Maria del Fiore, take in the views from Ponte Vecchio, and enjoy breathtaking views from Campanile di Giotto. To see reviews, other places to visit, and tourist information, read our Florence tour builder site . Traveling by combination of bus and train from Ravello to Florence takes 5 hours. Alternatively, you can drive; or take a train. Traveling from Ravello in August, plan for little chillier nights in Florence, with lows around 20°C. Finish up your sightseeing early on the 24th (Sat) so you can catch the train to Venice. Venture out of the city with trips to Padua (Scrovegni Chapel & Basilica di Sant’Antonio). There's still lots to do: explore the activities along Canal Grande, take in the views from Ponte di Rialto, capture your vacation like a pro with an inspiring photography tour, and admire the striking features of Basilica di San Marco. For more things to do, traveler tips, ratings, and other tourist information, use the Venice online trip itinerary builder . You can take a train from Florence to Venice in 2.5 hours. Alternatively, you can drive; or take a bus. In August, plan for daily highs up to 34°C, and evening lows to 22°C. Wrap up your sightseeing on the 28th (Wed) to allow time to travel to Munich. Munich is known for parks, museums, nightlife, historic sites, and childrens museums. Your plan includes some of its best attractions: take in nature's colorful creations at Schloss Nymphenburg, take in the spiritual surroundings of St. Peter's Church, engage your brain at Deutsches Museum, and stroll around English Garden. For photos, other places to visit, more things to do, and other tourist information, read our Munich trip planner. Traveling by flight from Venice to Munich takes 4.5 hours. Alternatively, you can drive; or do a combination of train and flight. Prepare for a bit cooler weather when traveling from Venice in August: high temperatures in Munich hover around 28°C and lows are around 14°C. Wrap up your sightseeing on the 1st (Sun) early enough to travel to Berlin. Berlin is known for museums, historic sites, nightlife, parks, and shopping. Your plan includes some of its best attractions: make a trip to Reichstag Building, step into the grandiose world of Charlottenburg Palace, explore the world behind art at Pergamonmuseum, and contemplate the long history of East Side Gallery. To find more things to do, traveler tips, other places to visit, and more tourist information, go to the Berlin trip planner. You can fly from Munich to Berlin in 3.5 hours. Alternatively, you can take a train; or drive. Wrap up your sightseeing on the 5th (Thu) to allow time to travel to Barcelona. Spend the 7th (Sat) among aquatic life with a scuba or snorkeling tour. Dedicate the 10th (Tue) to wine at some of the top wineries in the area. There's much more to do: pause for some serene contemplation at Basilica of the Sagrada Familia, explore and take pictures at Camp Nou, pause for some photo ops at Casa Mila - La Pedrera, and get to know the fascinating history of El Barri Gòtic. To see traveler tips, reviews, photos, and other tourist information, refer to the Barcelona road trip planning site . Fly from Berlin to Barcelona in 6 hours. Alternatively, you can take a train; or drive. In September, daily temperatures in Barcelona can reach 30°C, while at night they dip to 21°C. Cap off your sightseeing on the 10th (Tue) early enough to catch the train to Madrid. Dedicate the 14th (Sat) to wine at some of the top wineries in the area. There's still lots to do: examine the collection at Prado National Museum, make a trip to Puerta del Sol, admire the masterpieces at Museo Nacional Centro de Arte Reina Sofia, and admire the striking features of Plaza Mayor. To find photos, other places to visit, where to stay, and more tourist information, use the Madrid trip planner . Traveling by train from Barcelona to Madrid takes 3 hours. Alternatively, you can fly; or drive. Plan for a bit cooler nights when traveling from Barcelona in September since evenings lows in Madrid dip to 17°C. Finish your sightseeing early on the 14th (Sat) to allow enough time to travel to Lisbon. Change things up with these side-trips from Lisbon: Sintra (Castelo dos Mouros, Quinta da Regaleira, & more). And it doesn't end there: meet the residents at Lisbon Oceanarium, admire the masterpieces at Museu Calouste Gulbenkian, don't miss a visit to Jeronimos Monastery, and take a stroll through Alfama. For photos, traveler tips, more things to do, and tourist information, use the Lisbon travel route planner. You can fly from Madrid to Lisbon in 4.5 hours. Other options are to drive; or take a bus. Due to the time zone difference, you'll gain 1 hour traveling from Madrid to Lisbon. Expect a daytime high around 32°C in September, and nighttime lows around 19°C. Wrap up your sightseeing by early afternoon on the 19th (Thu) to allow time for travel back home.